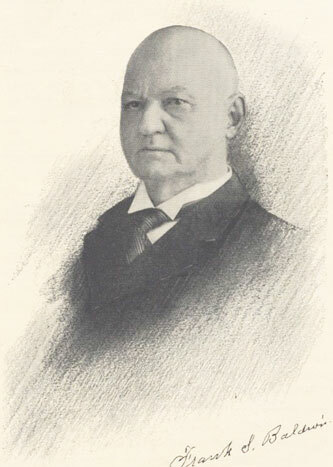 Frank Stephen Baldwin was born on 10 April, 1838, in New Hartford, Connecticut, in the family of the master builder Stephen Baldwin, an owner of architectural business. Although technically not an architect, the master builder Stephen Baldwin was a very good professional, known for several buildings in the region, e.g. The Meeting House of First Congergational Church in Watertown, Connecticut (see the nearby image), erected in 1839. Frank Baldwin devoted almost all his life to inventing and manifacturing machines, especially calculating devices and was granted several patents. In 1872 Baldwin married to Mary K. Denniston (1848-1928) of Williamsport, Pennsylvania, and they had 6 children: Frank Pardee Baldwin (1873–1946), Emma Virginia Baldwin (1877–1952), Eugene Denniston Baldwin (1880–? ), George Howard Baldwin (1890–1950), Lillian Isabel Baldwin (1886–1916) and Blanche Baker Baldwin (1891–1969). In the summer of 1840, when I was two years old, my family moved to Nunda, Livingston County, New York. At Nunda, I attended the first free school instituted by the State of New York. Afterwards, I was graduated from the Nunda Institute, where I had specialized in mathematics. In a class competition, I surprised my teachers by memorizing the decimal of Pi to 128 places, and ever since that time I have been able to write it without effort. In 1854 I was enrolled at Union College. My course was short-lived, for soon after my entrance, father met with a serious accident, which crippled him for life and forced me to take over the management of his architectural business. I then began experimental work on several ideas. In 1855, I applied for a patent on an arrowhead self-coupler for railroad cars. It was rejected on reference. This rejection only fired my ambition to succeed and perhaps determined my later course in the field of invention. In 1860, business took me to Fort Wayne, Indiana. An uncle at Carlyle, Illinois, had designed a corn-planter for which I assisted in securing a patent. This was a pioneer of machines of this class. Early in ’61, I went over to Carlyle to build the first model and arrange for the manufacture of the device. The Civil War broke out and upset my plans. I enlisted in the "Carlyle Home Guard"", but stress of circumstances brought me back to Fort Wayne after the “Three Months”. So the war fever in me had to burn itself out in looking after the family. In 1869, I went to St. Louis as manager of Peck’s Planning Mills. It was at this point I began to devote more and more time toward working out the ideas I had in mind. There was one in particular from which I now derive a great deal of satisfaction, because it is being used on such a universal scale. It is the metal lace latch seen on so many shoes. It came into being as an aid to my own quick dressing. About this time, I invented an instrument called the Anemometer, for recording the direction of the wind; also a registering step for street cars, recording the number of passengers carried; and a street indicator geared from the axle showing each street in succession, from an illuminated box, as the car passed. These I placed in successful operation. This ended my efforts to improve the railroad business. Shortly thereafter, I invented and patented the "Recording Lumber Measure", a machine which automatically measured and recorded four different kinds of lumber at the same time. This device set me thinking about computing machines and this point really marks the birth of the Monroe. In the office of a life insurance company at St. Louis, I had seen the Thomas type of calculating machine, devised by C. X. Thomas of Colmar, France, about 1820. I contrived the plan of substituting one cylinder for the nine cylinders in that machine, making a working model, which is now in the Patent Office at Washington. It was on this model that William Seward Burroughs, later of Burroughs Adding Machine fame, did some work for me in a small general machine shop, which he, with his father, had in St Louis. Not until about 1880 did Mr. Burroughs start work on his own adding machine with a keyboard set-up. The meteoric success of the business that bears the Burroughs name is history. In October 1872, I married Mary K. Denniston of Williamsport, Pennsylvania, who was visiting relatives in St. Louis. The year after, we moved to Philadelphia where I rented a small shop and started to make ten of the calculating machines. While thus engaged, I saw the expediency of a small machine to supplement the larger one, and designed an adding machine which I named the "Arithmometer", and this patent, dated July 28, 1874, was the first one of the kind granted me by the United States Patent Office. It was also one of the first adding machines sold in the United States. I placed both machines on exhibition at the Franklin Institute, Philadelphia, and was awarded the John Scott Medal for the most meritorious invention of the year. The only other inventor that year receiving a similar honor from the Institute was George Westinghouse for his air-brake. The Government granted me patent rights in 1875. He asked a clerk to bring in one of the sheets. Then he began calling off the items while I multiplied them on the machine. After about fifty items he cried, ‘Hold on, that is wrong.’ I looked at the sheet and there surely was a discrepancy. To make certain, I erased it and did it over. I said, ‘The error is in the sheet, sir’. ‘What, you don’t mean to say that the table is wrong?’ ‘Prove it for yourself, sir, said I. Had a bomb been exploded in the office, the consternation could not have been greater. I taught one of them how to use it and he began the work of checking, which took some time, but three months later he confessed to me under the pledge of absolute secrecy that he had found 135 errors in the tables, seven on one sheet. The lapse of time is my only excuse for breaking that pledge. I still have a copy of Mr. Taylor’s letter written to me from Philadelphia on August 8, 1874. I have used for the last four months one of your large machines daily in this department and have no hesitation in saying it performs its work rapidly and reliably, and for the purpose used does the work of at least three men with a certainty of correctness and greater rapidity. For Railroad Companies, calculating mileages and tonnages, it is, I consider, invaluable. Of course I was elated at this proof of the utility of the machine and plunged into the business with renewed vigor, but I soon found that I had undertaken too heavy a task. So I made a contract with the Reliance Machine Works of Philadelphia to manufacture the machines, while I took charge of the Sales Department. I met with considerable success in selling the adding machines, but found the town too slow to accept the calculators, so I concluded to try New York. There I sold several calculators to the leading life insurance companies and one to the State Department in Albany. Although pleased with my success in New York, I was anxious to secure the endorsement of the Government, so I resolved to strike at the fountainhead at Washington. I went to the office of the Secretary of the Treasury. After waiting until the crowd was thinned out, I walked boldly into his office and placing the machine on his desk, said: ‘Mr. Secretary, I wish to call you attention to a machine which I believe will prove very useful to the Government.’ I proceeded to demonstrate it. Secretary Benjamin Bristow looked at me quizzically for a moment and then pushed a button on his desk. An elderly gentleman appeared, whom I found afterwards to fill the position of Actuary of the Department. ‘Mr. Elliott, said the Secretary, this young man has a very interesting machine here which I wish you to examine thoroughly and send me a report upon.’ Mr. Elliott bowed and, beckoning me to follow, led me to his own office, which I frequently visited afterward. I found him not only a fine mathematician, but a most agreeable companion and very popular in the Departments, and it was through his assistance that I was able to place the remaining calculators with the Government. One afternoon he took me out to the National Observatory and introduced me to the celebrated scientist, Professor Simon Newcomb, saying: I want to present Mr. Baldwin, who writes and recites Pi to 128 places. Professor Newcomb was very much interested in the calculator and complimented me highly. All this time I was holding demonstrations in the evening at the hotel or in private houses with the machine, as most people had never heard of such a thing as ‘metal brains,’ and some, thinking I had manipulated certain figures, would insist on giving me problems of their own, often in their haste making a mistake and having to retire in confusion. One evening a young man introduced himself as the Private Secretary of General Benjamin F. Butler and insisted that I should show it to the General as he was deeply interested in mechanics. I spent two hours with the General going over the machine. When I had finished, he turned to me and said: Well, young man, you have made a most remarkable machine, but I tell you, you are thirty years in advance of the Age. Rather cold comfort that, but my experience since has convinced me that he was about right. Although I had been successful in placing the ten calculating machines, they had been made principally by hand, affording no profits. As the Reliance Machine Works did not have the facilities for quantity production, and the failure of Jay Cooke, with the ensuing panic, caused such a stagnation in business, I gave up the fight and returned to St. Louis in 1876, where, after a while, I started to work up gradually. It was about this time that one of my 1875 models found its way to Europe, falling into the hands of a Mr. Ohdner, a Swede. He took out patents in all European countries on a machine that did not vary in any important particular from mine, and several large manufacturing companies in Europe took it up. It is now appearing under ten to fifteen names in Europe, the more important being Brunsviga and Triumpator, manufactured in Germany. In 1900, I patented the Baldwin Computing Engine, a machine by which multiplication or division was performed by one stroke for each digit. In 1902, I brought out the Baldwin Calculator. I went back to first principles in this machine, employing the reverse action in dividing and subtracting, the carrying motion being provided on a separate shaft, reducing the diameter of the main cylinder to one half the size of that of the 1875 machine. Some of these machines are still in use, after more than a quarter century of service. In 1905, I designed a listing machine with only ten keys and a spacer. In 1908, I was awarded a patent on the Baldwin Recording Calculator, which combined the listing machine with the calculator. This machine, with the keyboard and oscillating bars, formed the germ of the present Monroe. 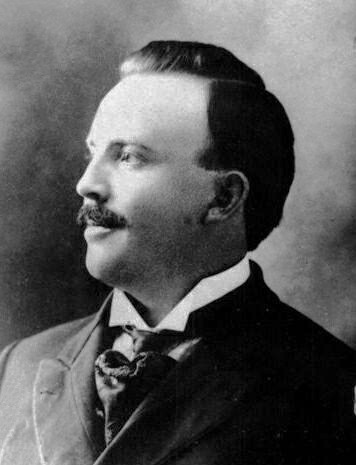 In 1911, I became acquainted with Mr. Jay R. Monroe, then associated with the Western Electric Company in New York City. Only a few years prior he had been graduated from law at Michigan. He was a young man then, and is still young in years, but mature in ideas and judgment. Mr. Monroe had always been of a mechanical turn of mind, but fortunately his work, following his graduation, was along clerical and commercial lines. This brought him in close touch with calculating machines and the various uses to which they were being applied, and he began to study them for their weaknesses, endeavoring to devise ways in which they could be improved. It was about this time that he told me that the day had arrived when business was demanding a more efficient machine than had then appeared on the market – one that anyone could operate after one explanation; one that was portable; one that was simple in construction; one that furnished perfect visibility with a proof of accuracy; one with a keyboard set-up; one that would not only add, but multiply, divide and subtract as easily as it could add. I showed him my machine. At once he saw it possibilities. We joined hands and set about designing the machine to make it as nearly perfect as possible in its adaptation to the needs of modern business. The result of that work and our later association is the Monroe High Speed Adding-Calculator which is filling no small part in faithful, economic service in the realm of business. Quite an interesting interview, although some moments are questionable, for instance the history with Odhner's invention. Frank Baldwin died on April 8, 1925, in a private hospital in Morristown, New Jersey, following an operation, within two days of reaching his 87th birthday. Until the last day of his life, his mind was clear and keen, and his interest in his family and the things about him was just as pronounced as ever. Besides the several patents of calculating devices, Baldwin is a holder for several other patents for machines—e.g. for cement or mortar mixes (1891) and roundabout (caroussel) in 1892.